Puppy Potty Breaks…Yes or No for Your Business? Do you offer Puppy Potty Breaks in your pet sitting business? If you’re just starting out, you might find several compelling reasons to say yes…or you might think again, and say no. When we first opened our pet sitting business, I couldn’t wait for our first puppy client. It had been years since we’d had a puppy of our own (who lived to almost 17!) and our next dogs were older rescues. I researched pricing with other pet sitting companies in our province and was surprised that many didn’t even offer the service! How outrageous! Well I’d soon change that! My customers were about to be pampered. For pricing, I hovered somewhere between a regular 30-minute dog walking price and a cat visit. After all…how long could it take to put a puppy out for a pee and back in its crate, right? Ten minutes? I figured fifteen tops. Turns out it nearly always takes a half hour or close to it when you count writing the note. Try telling the client this. They won’t believe you. Then again…they’re puppies. Everyone loves a puppy! Puppies are cute, fuzzy, soft, snuggable, and fun to play with. Puppies are quick and wiggly. You can spend a lot of time trying to catch the little critters and then not lose your grasp and drop them! When you arrive, there will be a mess to clean up. When you put the pup outside, there will be a mess to clean up. You’ll need to provide a meal midday for a pup – and wait until he’s finished eating and drinking. And then put the pup outside a second time. Then there will be a mess to clean up. And if you don’t write the note very fast…there will be another mess to clean up before you get out the door. Double that with two pups and try to keep the one out of the other one’s mess while you run for more paper towels! How Much Time will You Really Spend at Your Puppy Visit? We’re up to a half-hour now and you’ve hardly had a chance to enjoy them. Are You Changing Your Mind Yet? It sounds like I’m a puppy hater! But no. I love pups. Other people’s pups who do not belong to clients. I can hug them and leave them. They’re hard work. You’ll find they’ll make your back ache because you’re continually bent over (sometimes over a wire enclosure.) And they have more energy than the sun so you won’t stop running. Wear slippers…or you’ll end up using your socks to sop-up pee. As a pet sitter, you don’t have the luxury of unscheduled time so unless you harden your heart and price the visit properly, you’ll be sorry. We try to keep to a full half-hour visit rather than a puppy potty break, which clients always equate with less time and money. 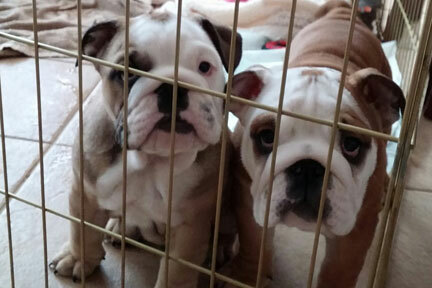 But we’re only human and sometimes we break down and do something rash, as dog lovers do…like taking-on two adorable bull dog pups for a potty break at a lower price…for three months. At that point the client will pay the full two dog rate for a half hour. Oddly enough, that’s when the dogs will be easier to manage and we’ll actually be able to go out and have fun! But…it’s also about the time clients will probably feel the dogs can hold their pee for eight or nine hours and we’ll find our services are no longer required. This is one of the hardest parts of all in puppy care…spending all that time helping to raise them, and not being able to enjoy the dog you’ve grown to love. But that’s what we do as pet sitters – they’re worth it.